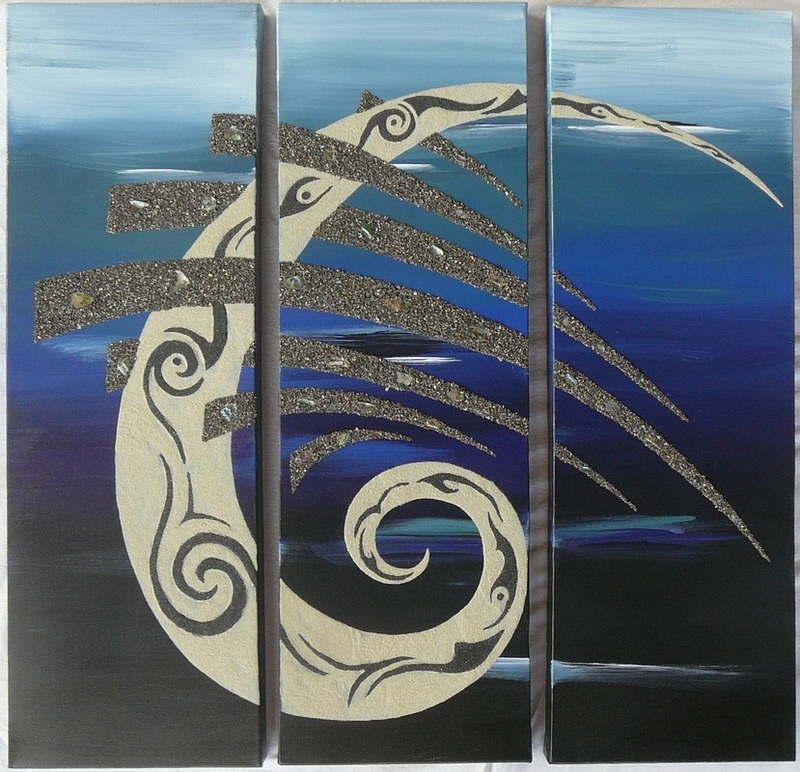 I am a self taught artist living at Parua Bay, and have been painting for 9 years. I find that I learn through observation of my surroundings along with comments and suggestions from other people. I have had several successful exhibitions in local cafes but sell much of my work through attending markets. My work incorporates natural materials such as sand, shell, gemstones and flax which are used both raw and in relief. The paintings are created on a range of materials including canvas, plywood, timber and hardwood using acrylic paints. Shells such as paua & mother of pearl have been suspended within some of the works. Each piece of art has unique design work through it. Sizes range from diptychs at 150x150mm to large triptychs at 3.0 metres wide. Each piece generally starts from a point of celebration, either of people, natural materials or aspects of the world around us and incorporate many flowing figures and designs. A design may come from the curve of a beach, the spiral in a shell or a person’s reaction to these. The background colours for each work are chosen to showcase the materials or designs used. After using gemstone chips within the sand on some of the paintings and being very attracted to the stones I have started to make jewellery using gemstones as well. The greatest satisfaction from my work is gained through people really connecting with a painting and finding something meaningful in it. This happens especially with commissions where I am able to work with clients to incorporate their artistic thoughts and ideas and come up with something that works for them. I work from a studio at home and as I take my work to markets am not always at home. You are welcome to make an appointment to visit so please contact me through the website/email below. The website has a large range of paintings and also information on what markets I will be attending if you would like to come and see much of the newer work. Phone 09 or 027 4365620.